The 165 countries who signed the Convention accepted this definition as legally binding. This definition makes a distinction between natural variability whose change is merely observed and a change of climate which alters the composition of the global atmosphere, which can also be attributed directly or indirectly to human activity. It does not seem to matter who carries out this attribution or whether it is directly or indirectly. This appears as a footnote to the first page of the “Summary for Policymakers” in Reports No 3 and 4 and presumably applies to their title. It is not a proper definition as it only refers to any change in climate over time. But it does not talk about attribution even if they go ahead and do it in practice. So, any change of climate is Climate Change. Why do they need a definition at all? Climate change refers to a change in the state of the climate that can be identified (e.g., by using statistical tests) by changes in the mean and/or the variability of its properties, and that persists for an extended period, typically decades or longer. Climate change may be due to natural internal processes or external forcings such as modulations of the solar cycles, volcanic eruptions and persistent anthropogenic changes in the composition of the atmosphere or in land use. Note that the Framework Convention on Climate Change (UNFCCC), in its Article 1, defines climate change as “a change of climate which is attributed directly or indirectly to human activity that alters the composition of the global atmosphere and which is in addition to natural climate variability observed over comparable time periods”. The UNFCCC thus makes a distinction between climate change attributable to human activities altering the atmospheric composition, and climate variability attributable to natural causes. Weather forecasting provides a service which is considered to be reliable only for a week or two in advance, This is the result of a lack of adequate understanding of the behaviour of fluids and their chaotic behaviour, Since this finding applies to a combination of climate change attributable to human activities altering the atmospheric composition, and climate variability attributable to natural causes it seems unlikely that a concentration on the first one alone is going to help forecasters to get beyond current limitations. augmented with polar regions and the Caribbean, two Indian Ocean and three Pacific Ocean regions. In total this Atlas gives projections for 35 regions, 2 variables, and 2 seasons. The projections are made under the Representative Concentration Pathway scenarios, or RCPs, which are introduced in Chapter 1 with more technical detail given in Section 12.3 (also note the discussion of near-term biases in Sections 11.3.5.1 and 11.3.6.1). Maps are only shown for the RCP4.5 scenario, however the time series presented show how the area-average response varies among the RCP2.6, RCP4.5, RCP6.0 and RCP8.5 scenarios. Spatial maps for the other RCP scenarios and additional seasons are presented in the Supplementary Material. Figures AI-1 and AI-2 give a graphical explanation of aspects of both the time series plots and the spatial maps. While some of the background to the information presented is given here, discussion of the maps and time-series, and important additional background is provided in Chapters 9, 11, 12 and 14. Figure captions on each page of the Annex reference the specific sub-sections in the report relevant to the regions considered on that page. 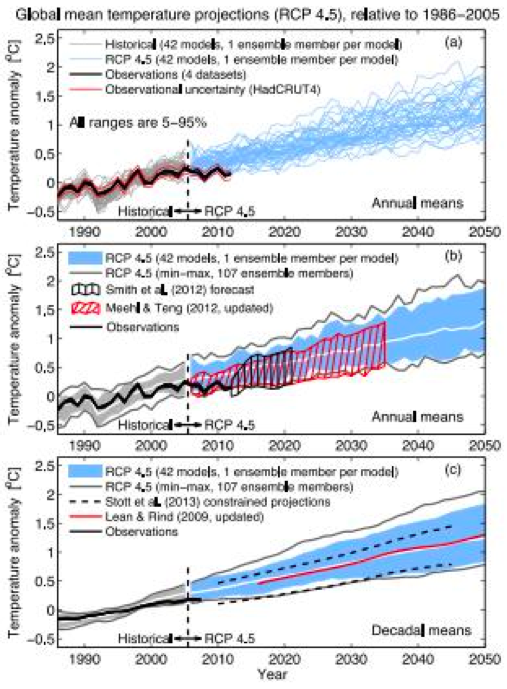 The projection of future climate change involves the careful evaluation of models, taking into account uncertainties in observations and consideration the physical basis of the findings, in order to characterise the credibility of the projections and assess their sensitivity to uncertainties. As discussed in Chapter 9, different climate models have varying degrees of success in simulating past climate variability and mean state when compared to observations. Verification of regional trends is discussed in Box 11.2 and provide further information on the credibility of model projections. The information presented in this Atlas is based entirely on all available CMIP5 model output with equal weight given to each model or version with different parameterisations. 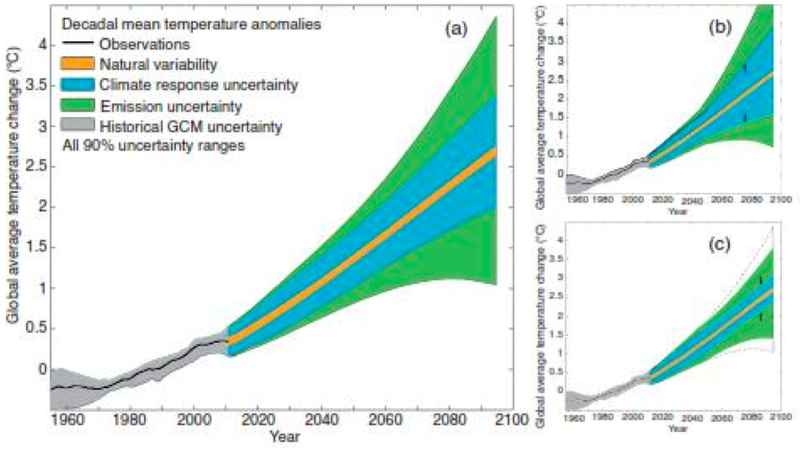 The following Figure (FAQ1.1 Fig 1) is a summary of the IPCC uncertainties. It should be noted that the boundaries are those of 90% significance. This is below the more usual figure of 95% commonly applied in the scientific literature and it means that there is a 10% chance of any value falling outside these bounds. Since these uncertainties include those of projections of natural variability it is relevant to ask how it compares with the accuracy with which weather forecasters are capable of successful forecasts. 93.7% of maximum temperature forecasts are accurate to within +/- 2°C on the current day (36-month average 84.0 % of minimum temperature forecasts are accurate to within +/- 2°C on the first night of the forecast period (36-month average). 89.8% of maximum temperature forecasts are accurate to within +/- 2°C on the next day (36-month average). 79.5% of minimum temperature forecasts are accurate to within +/- 2°C on the second night of the forecast period (36-month average). These actual forecasting inaccuracies are in a completely different universe from the supposed inaccuracies of the IPCC which claims to incorporate them. They feel proud if they can get near ±2ºC. which is way above the claimed IPCC accuracy of their global temperature of a fraction of a degree. • They do not have a plausible temperature record from which they could judge their projections. • My previous Newsletter (324X) shows that their models have been falsified. Therefore they should be rejected. There are two definitions of Climate Change. The Framework Convention on Climate Change (FCCC), and the nations who signed it, accept a definition of Climate Change that ir means only changes of climate caused by human emissions of greenhouse gases. 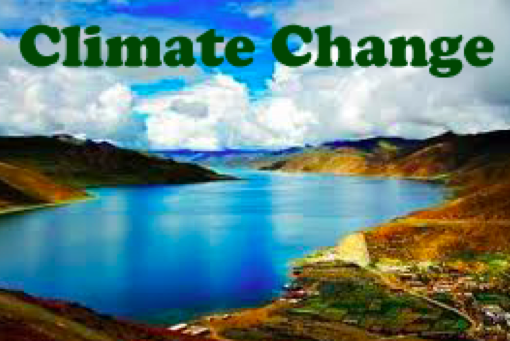 The Intergovernmental Panel on Climate Change (IPCC), the body which is supposed to advise the FCCC and the signatories, use a definition of Climate Change that includes any change in climate over time, whether due to natural variability or as a result of human activity. Any failure of their projections to comply with current or recent climate properties may therefore be due to deficiencies in the projections of both the natural and supposed human effects as in the IPCC definition of climate change, not the FCCC definition which is concerned only with human effects. The published projections fail completely to take account of the inherent uncertainties of natural variabilility which is supposedly incorporated in them.